Arkad Health & Safety are the UK manufacturer of the unique TREADSURE© Traction Enhancement safety product. The TREADSURE© product has been selected as a finalist in Tomorrow’s Contract Flooring Awards and Tomorrow’s Health & Safety Awards for 2019. We have been featured in numerous trade publications and continue with intensive ongoing marketing and press releases to support sales and brand awareness. TREADSURE© is a unique non-etching treatment that minimises the risk of slip and fall accidents by increasing traction on floors or footwear. TREADSURE© can be used where other anti-slip products cannot. Agents are required across all of the UK and Ireland. Details of territorial exclusivity can be negotiated. We offer a commission of up to 40% with recurring commissions on repeat sales. Territories will be exclusive to selected agents. Sales agents are provided with product training, pricing, and literature. They are also supported through our ongoing marketing and trade exhibitions. A CRM system is available to all sales agents to receive and manage leads and sales. 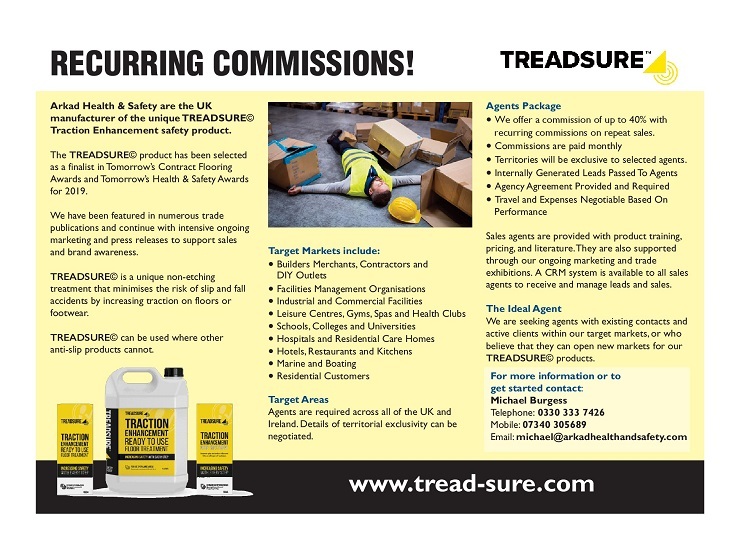 We are seeking agents with existing contacts and active clients within our target markets, or who believe that they can open new markets for our TREADSURE© products.